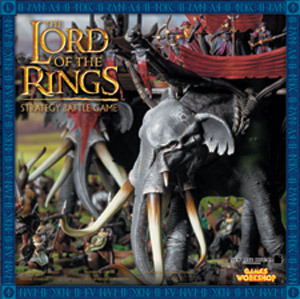 The Lord of The Rings rulebook is the ultimate and essential guide to playing The Lord of The Rings Strategy Battle Game - the game of adventure and battles in the world of Middle-earth. 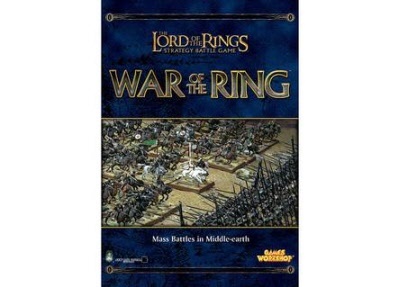 This 240-page hardback rulebook contains all the information you need to get started with The Lord of The Rings Strategy Battle Game, including: full rules for fighting tabletop battles, a guide to the races and armies of Middle-earth, and a hobby section on how to choose, collect and paint a The Lord of The Rings army of Citadel miniatures and set-up a battlefield to fight over. 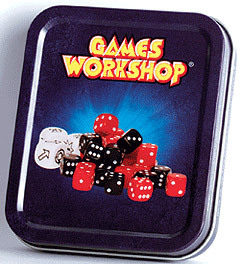 Games Workshop, 2009. 1st edition. Hardback (no dustjacket issued). Illustrated. 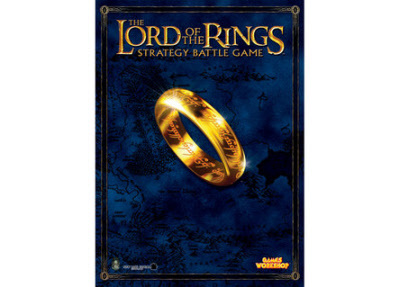 As the Third Age draws to a close, Middle-earth is ravaged by the War of The Ring. 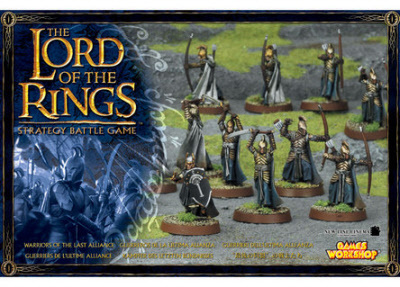 Great battles are fought across the lands as Sauron's fell armies invade from Mordor to bring the Dark Lord's dominion to all. 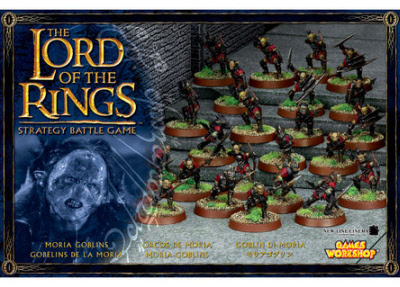 Those Orcs that command a warband are cunning, powerful brutes that have risen above the internecine warfare of Mordor's pits. 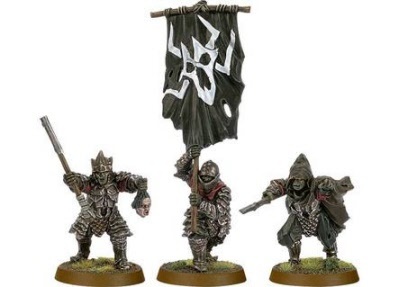 These metal Morannon Orc Commanders can be used to upgrade your Morannon Orc formations in War of The Ring, whilst Captains, Banner Bearers and Shamans are always useful additions to a skirmish force. An ancient evil from another age, the Watcher in the Water is a large, tentacled monstrosity that waits in the depths until it senses nearby prey. Exactly what this creature may be is a mystery; indeed, few have ever survived to tell of its existence and even the Fellowship of the Ring barely escaped its clutches alive. What is known is that it is incredibly powerful, able to tear a man in half with ease, or otherwise flatten him beneath its immense bulk. 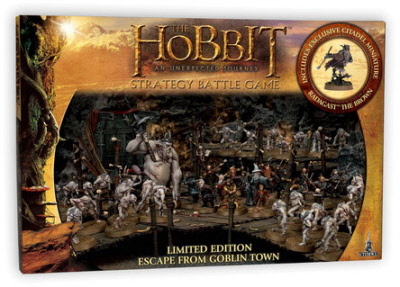 Re-live the action from The Hobbit: An Unexpected Journey. 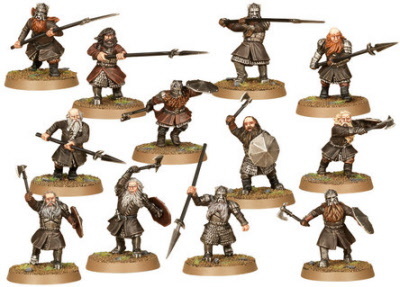 Thorin Oakenshield's quest to reclaim the Dwarven Kingdom of Erebor takes his brave band of Dwarves - accompanied by the Hobbit, Bilbo Baggins, and the mysterious Wizard, Gandalf the Grey - far across the trackless wilderness of Middle-earth. 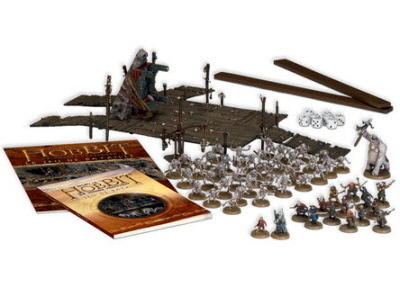 The box contains the rulebook, 8 dice, a ruler, 56 Citadel miniatures (including Gandalf, Bilbo, the thirteen dwarves, the Goblin King and Radagast). Tom the Troll, William the Troll and Bert the Troll are colossal bullies who raid villages and waylay travellers to satisfy their considerable appetites. They are strong, tough and exceedingly dangerous. 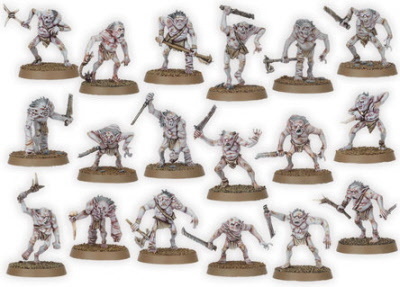 A sinister kingdom, lorded over by the giant, bloated form of the Goblin King, Goblin Town is a dishevelled realm inhabited by stunted, twisted creatures. This mockery of a court, with its cruel bully-kind, is home to creatures of a deadly nature, troglodyte denizens of implacable cruelty. Goblin Town is a fantastically detailed scenery piece. It is made largely of long strips of timber that have been haphazardly combined to provide long, rickety walkways suitable for the inhabitants of Goblin Town. As well as chain detailing and wide ladders, it is scattered with bones and skulls, and some fragments of bones are strapped like totems to the large poles that hold the walkways up. Rugged and erratic, this is impressive scenery piece can be constructed in a number of different configurations. 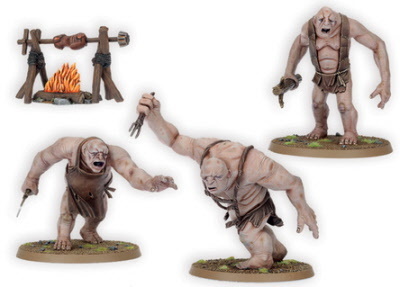 The fast-moving and fanatical Hunter Orcs serve as the right hand of Azog, a relentless band who will stop at nought to slay his quarry. Powerfully muscled, with thick matted fur, Fell Wargs would be considered fearsome even before one saw the dark glow in their eyes and realised that they are possessed by a sinister eldritch force. 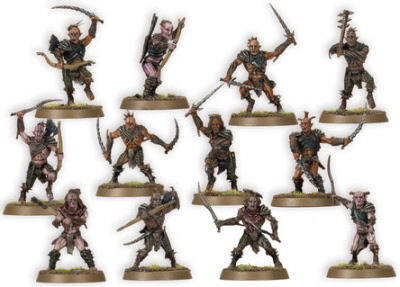 These Hunter Orc miniatures come in an array of dynamic poses. They sport mainly bald heads with tufts of hair in the centre, lending them a savage appearance. 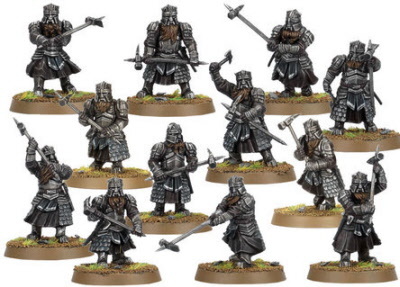 They have muscular torsos with limited armour across thighs and upper bodies. 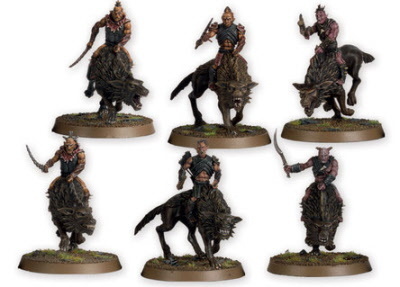 Carrying a range of weaponry, the Hunter Orcs are sitting atop the Wargs, which are sculpted to have the appearance they're on the run. In a variety of poses, the creatures possess a prominent spine, with thick fur covering the front of beast. Each one has a ferocious head, snarling expressions and exposed teeth. 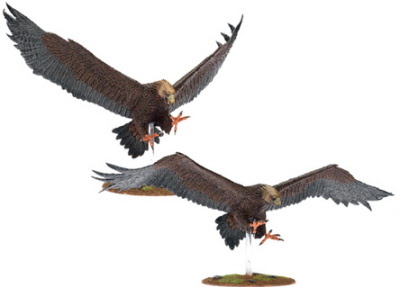 This kit contains 44 components and six 40mm round bases with which to make 6 Hunter Orcs on Fell Wargs. 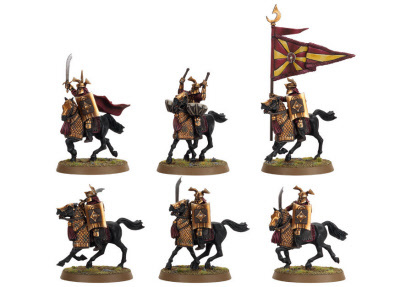 Games Workshop, 2009. 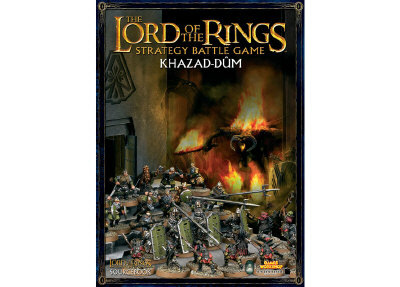 Doublesided poster on glossy paper to promote the new release of the Games Workshop battle game. 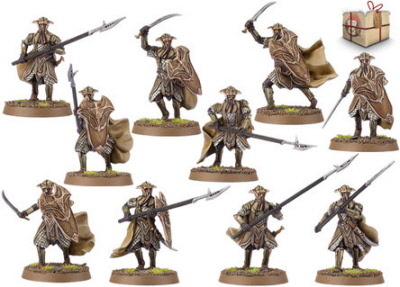 With on the front Gandalf the White leading the army, on the back Saruman and his host. 24x36"/59x84 cm.